We have over a hundred clients in a variety of industries, all with equally varying needs. As a result of our experience, we are equipped to handle even the most strictly defined or time-intensive projects. Our flexibility allows us to create a diverse offering of sites, outfitted with an array of capabilities. From informational and promotional sites to database driven and e-commerce sites, iNNOV's creations are tailored to the specific needs of your business. Unlike most development companies, iNNOV is completely operated in-house. There is no middle man or need to send projects off to another company. As a result, we are able to control the quality of our work and guarantee our clients' projects from start to finish, ensuring a design that represents them and delivers results, using our custom web design method. Below is a brief description of our process. 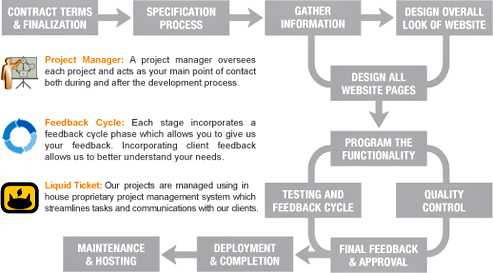 Each client is assigned a project manager who monitors the entire process of their project, making sure it is on schedule and that the client is involved and satisfied through each stage. Once the mockup is chosen and the graphic design work is complete, the project then is passed along to the development department where the project is programmed. After great care, the final project is then deployed, making it viewable to the world. We also host the websites we create, allowing our clients to focus less on technical details and to concentrate more on the success of their business. Once the specifics of each project are determined, the project then enters the graphic department, where our talented design team creates several initial mockups. The next step is quality control, where our Marketing and Communications department checks for spelling/grammar errors and reviews the overall quality of the product. We take great pride in continuing our services once development is complete, making sure everything we have created works properly and stays fresh. Additionally, we offer a variety of maintenance and support services, ranging from management of online advertising and search engine optimizations to general modifications and routine maintenance that can be performed in 24 hours or less.